Caproni Са 73, спроектированный в 1924 году, имел конфигурацию "перевернутого" полутораплана и вначале строился как коммерческий транспортный самолет на 10 пассажиров и двух членов экипажа. На Са 73 устанавливались два незакапотированных V-образных двигателя ДальшеMore>>> Isotta-Fraschini Asso мощностью 500 л. с. (373 кВт), размещенных тандемно в стойках кабана, поддерживавших центральную секцию верхнего крыла. Почти аналогичным был вариант Са 73bis, оснащенный двумя двигателями Lorraine-Dietrich мощностью по 400 л. с. (298 кВт). Бомбардировочный вариант с моторами Asso от Са 73 обозначался как Са 73ter (иногда Са 82) и вооружался двумя пулеметами, в носовой и верхней фюзеляжных установках, а также мог нести до 900 кг бомб. Са 74: обозначение ретроспективно было присвоено варианту Са 80 с двумя звездообразными двигателями Bristol Jupiter каждый мощностью 400 л. с. (298 кВт); самолет также строился в варианте санитарного Са 80S и в модификациях Са 88 и Са 89, отличавшихся формой фюзеляжа, в том числе установкой убирающейся подфюзеляжной турели. New Caproni Fitted With Two "Jupiters"
ONE of the great advantages claimed for the radial air-cooled aero engine is its short overall length, which has the effect, when the engine is mounted in the nose of a tractor biplane, of greatly reducing the moment of inertia, thus adding very materially to the manoeuvrability of the machine. That the radial engine has other advantages may be granted, but we think that perhaps the one just mentioned is often the deciding factor in the choice of engines for certain performances. Another possibility of benefiting by the short length of radial engines has just been demonstrated by the famous Italian aircraft designer, Giovanni Caproni, by the production of a new type of machine in which two Bristol "Jupiter" engines are placed in tandem above the hull. Thanks to the arrangement of the engines, it has been possible to design a machine in which, in spite of the tandem arrangement, all heavy masses are concentrated within a fairly small compass, with consequent gain in manoeuvrability. The machine in question is known as the Caproni 80, and has been designed as a night-bomber. From the accompanying illustrations it will be seen that the machine has somewhat the appearance of a semi-thick-wing flying boat, although, in point of fact, the C.80 is a land machine, but with a boat-built fuselage, and the hull placed very much as is the hull of a flying boat. In this respect, the general arrangement is somewhat reminiscent of that of the D.H.10, but the two engines, instead of being placed on the wings, are, as already mentioned, placed centrally one behind the other above the hull, one driving a tractor airscrew and the other a pusher. The tandem arrangement of engines has never been very much favoured in this country, but is one which has considerable vogue in certain foreign countries, notably in Italy, and it may be recollected that this is the arrangement chosen in the famous Dornier "Wal," of the type used by Amundsen in his recent attempt to reach the North Pole, and which will also, it is hoped, be used by Capt. Wilkins in his projected expedition to the Antarctic, as related elsewhere in this issue of FLIGHT. In France also several machines have been built with this engine arrangement, notably the C.A.M.S. and Latham flying boats, both of which types have proved very successful. Wind tunnel experiments carried out in this country on tandem arrangements also seem to indicate that fundamentally there is no reason to expect it to give trouble, provided the rear airscrew is designed with slightly larger pitch than that of the tractor, so as to allow for the fact that it is working in the slipstream of the front propeller. One advantage of the tandem arrangement is that, the centres of thrust of the two engines being concentric, no turning moment is set up by the fact of one engine stopping, as is the case when the engines are arranged on the wings. It is generally thought that when the front engine stops and the rear airscrew is no longer working in the slipstream of the front screw, the pitch of the pusher, having been made purposely greater to allow of its normal working in the slip stream of the front screw, is too great, and that thus a certain amount of loss of efficiency is incurred. Practical tests have not, however, so far as we are aware, proved this to be a serious objection, and we believe that in the Bolton and Paul "Bodmin," for instance (which has its engines centrally placed in the fuselage with transmission drive to airscrews on the wings), it was found that with the front engine and its propellers stopped, there was no appreciable loss of efficiency when the rear engine with its two "over-pitched" pusher screws was running by itself. It would thus seem that possibly this arrangement of engines is deserving of more attention than it has hitherto received in this country. From a practical point of view, there is certainly considerably greater opportunity of effecting repairs or adjustments to an engine centrally placed than to one placed out on the wing, and the performances of the Caproni and other machines in which the tandem arrangement is employed seem to show that, from the point of view of efficiency also the tandem arrangement may have its advantages. Certain problems may crop up in connection with the presence and absence of slipstream on the tail planes, but in this respect the twin engine arrangement should if anything be preferable to the use of a single engine on a flying boat in which, when the engine stops, the whole of the slipstream disappears, whereas with the tandem arrangement there should be, if anything less difference in trim between "engine off" and "engine on" conditions, as only the slipstream of one engine would disappear in the case of accidental stopping of one engine. In the main, the photographs of the Caproni 80 are self-explanatory. The central hull or fuselage is, as already mentioned, a boat-built structure, and the only unusual feature of the machine is the use of a short top plane. The front view of the machine gives an excellent idea of the angle at which the interplane struts slope inwards. Presumably this arrangement has been chosen in order to reduce the end loads on the top spars. We have no information relating to the wing section used, but the photographs show it to be a fairly thick section, which fact, doubtless, accounts for the use of single-bay bracing. The two-wheeled undercarriage is attached underneath the inner interplane struts giving a wide wheel-track, and the whole arrangement seems to indicate the possibility of turning the machine, by suitable shaping of the hull, into a twin-engined amphibian flying boat. This, however, is not, we believe, the intention, but the particular arrangement chosen is due chiefly to the tandem engines and to a desire to provide an unrestricted field of fire for the two gunners. It is stated, however, that should the machine be forced to descend on the water, the boat-built hull would keep it afloat for an indefinite period, while special air bags mounted under the lower plane, would give the necessary lateral stability on the water. The two Bristol "Jupiter" engines are mounted on a structure independent of the wing structure, in the form of two sets of struts forming the letter "M" as seen in side elevation. The accessibility of the two engine units is well brought out in the photographs, and it may be added that the petrol tanks, which are placed between the engines, are separated from them by fire-proof bulkheads. Perhaps, according to British ideas, a preferable arrangement would have been to place the tanks in or on the top plane, giving direct gravity feed to the engines, but doubtless Signor Caproni was induced to place them between the engines by his desire to concentrate all heavy weights as far as possible so as to maintain good manoeuvrability. The pilot's cockpit is placed in line with the leading edge of the lower plane, below and slightly aft of the front engine. In view of the proximity of the tips of the front propeller, the substantial wind-screen fitted does not appear to be an unnecessary precaution. Of the two cockpits for the gunners, one is arranged in the extreme nose, where the field of fire forward, and, in fact, throughout the whole hemisphere, is particularly unrestricted, while the rear gunner is situated just aft of the wing, where he commands a view and a more or less unrestricted field of fire in all directions, except forward, downward, and to some extent aft, where his field of fire is to some extent blanketed by the biplane tail. Altogether the machine seems well designed for self-protection against attackers. Its main function, is, as already stated, that of a night-bomber, and bombs to the weight of 800 kgs. (1,760 lbs.) may be carried. During preliminary flight tests it was found that the Caproni 80, carrying a useful load of 1,400 kgs. (3,080 lbs. ), would fly level, or even climb slightly on one engine at a height of 3,300 ft. In later tests the following climbs were accomplished: the useful load in this case being 1.950 kgs. (4,300 lbs.) :- 1,000 m. (3,300 ft.) in 5 m. 355.; 2,000 m. (6,600 ft.) in 12 m. 55s. ; 3,000 m. (10,000 ft.) in 21 m. 10s. ; 4,000 m. (13,000 ft.) in 32 m. 10s. and 4,500 m. (14,800 ft.) in 41 mins. These performances were obtained without engine cowlings, and it is expected that with engine cowls and different propellers (a certain amount of experimenting still remains to be done to find the most suitable propellers for the somewhat peculiar conditions of the tandem arrangement), even better results will be obtained. With the engine uncowled the top speed was 175 kms./hr. (109 m.p.h. ), but it is expected that this will be considerably improved upon when the modifications indicated have been carried out. The landing speed is stated to be 71 kms./hr. (44 m.p.h. ), which seems extremely low. As no figures are available relating to the wing area, it is not possible to form an opinion as to whether or not this figure for the stalling speed is likely to be accurate. AN ITALIAN SERVICE FLIGHT: One incident during General Balbo's (Italian Under-Secretary for Air) air tour of the stations on the Egean Sea, and in Cirenaica and Tripolitania. Inspecting an Escadrille of Capronis and Ansaldos at Berka (Bengazi). 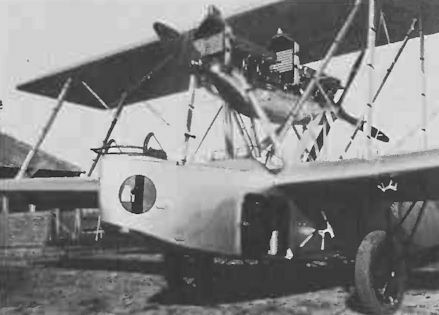 THE CAPRONI 80: A night-bomber fitted with two Bristol "Jupiters" mounted in tandem. Three-quarter front view. 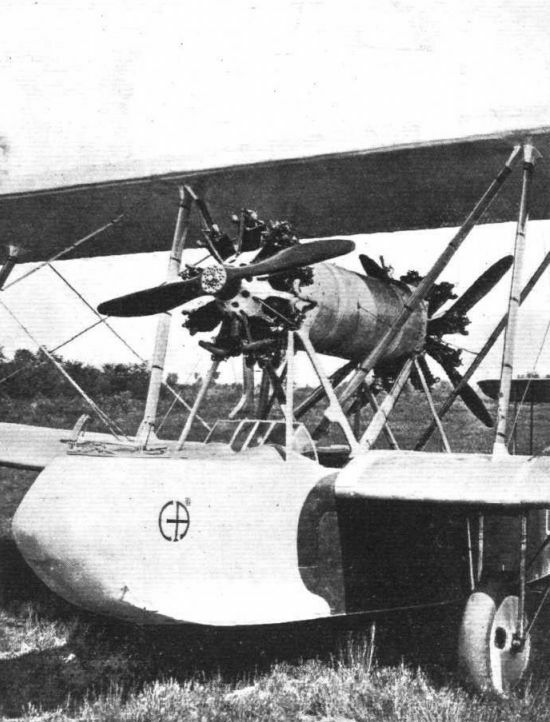 THE CAPRONI 80: View showing mounting of the two Bristol "Jupiter" engines. The petrol tanks are placed between the engines. THE CAPRONI 80: This front view gives an excellent idea of the slope of the inter-plane struts. THE CAPRONI 80 NIGHT-BOMBER: Side view. 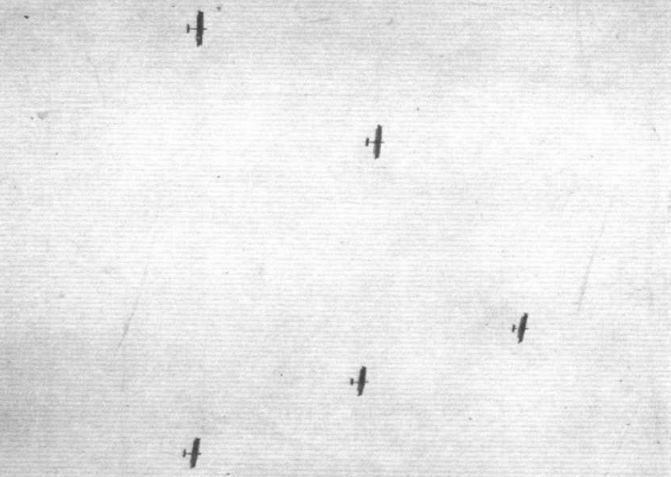 Aerial visitors to the Lido: A flight of twin-engine Capronis of the Italian Air Force paying an official visit to the scene of the Schneider Contest.